Our hands are never empty if we are holding on to each other. One year ago yesterday my son’s life changed after having decompression brain surgery for Chiari malformation. Well that is not exactly true. My life changed as well with so many blessings sprinkled with set backs and difficulties. One year ago hardly seems real. It feels like it really was just yesterday. Holding my son’s hand after brain surgery a year ago. worry and the faith that God the Father would take care of him wrestled for first place in my heart. Thinking over how God had given me the honor of being his mom and the privilege of being there for so many moments in his life from the very first time he wrapped his tiny hand around my finger. Holding my dad’s yesterday before surgery. the very first time I wrapped my tiny hand around his finger. And it made me realize that in my family our hands are never empty because we hold onto each other. And in them I have learned how to encourage, support, and walk beside those that I love so much. Most importantly of all, I learned to place my whole life in the hand of the Lord Jesus. It doesn’t matter what your family looks like or whether it’s considered normal, whether it’s blended or not, whether you have the word “step” in front of mom or not. What matters is holding onto each other. Making memories every chance you get and deciding that no matter what you’ll never let go. Thank you daddy for teaching me how to hold on to the gift of family with one hand and our Heavenly Father with the other. Are You Having A Moment? This Christmas was filled with lots of moments for our blended family, wonderful boring moments and I couldn’t be happier with that. Yes you read that right. I did say boring and I did say happy. This Christmas was very mellow. We carried out our yearly traditions. Made memories and visited a few new places together to make new ones. We even managed to sneak in a “pajama day” at the request of my sweet stepson just a few days before Christmas. We celebrated with family and shared lots of laughter. The darkness, the worry cloud that sat on my shoulder last year was gone. So like I said, boring, and grateful for it. 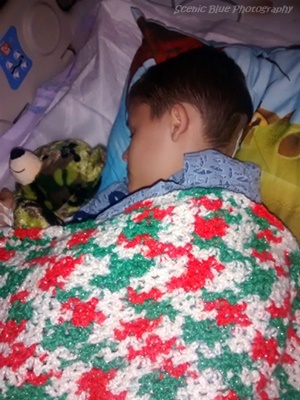 Last year, as many know, just before Christmas, we learned that our youngest son was going to have brain surgery for Chiari Malformation at the first of the year. So the holidays were consumed with big moments, such as staying strong and not letting him see how utterly scared I was. Moments like hiding how worried I was that this might, just might, be our last Christmas with Luke. Lost in thought of how there is no cure and what if something goes wrong during the surgery and he isn’t the same. Moments while among all the holiday gift shopping, I was searching for pajamas to fit a ten year old that buttoned down the front. And when finally finding some complete with a star wars theme, a moment when I could barely see my way to the cashier for the tears as I imagined when he would have to wear them while having to deal with doctors, nurses, medications, pain, and anxiety. However, in those moments surrounded by all three kids, wonderful family, our amazing church and supportive friends and community God chose last Christmas to be one of the best we have ever had! And from last Christmas to this Christmas God has felt so close. His perfect peace was truly a key to surviving all the moments we faced. Life has been rapid, busy for me this year. Writing, homeschooling, volunteering and Bible study classes have consumed me. In fact I’ve realized that the only thing I haven’t done much of is take a moment for me. It got me to thinking how moms like me give so much to every one else. A few months ago I had the privilege of writing a book endorsement for a fellow “blendermom”, Kristie Carpenter, and it was published in her latest devotional book Blended Mom Moments. It is filled with weekly scriptural devotions interspersed with stories and nuggets of wisdom. I am really looking forward to diving into this book and spending some time with God. He really wants to spend time with you, minister to you, shepherd you and speak to your heart. I’m reminded of the words of the song What Do I Know Of Holy, by Addison Road, “I tried to hear from Heaven but I talked the whole time…” Sometimes we just need to stop talking in order to hear God speak to us. This new year I encourage you to stop. Put your feet up, savor a nice cup of coffee and have a moment. Have a moment of quiet, a moment of prayer, a moment of renewal. It will strengthen you during life’s big moments! *You can purchase a copy of “Blended Mom Moments” Signed Copy Here and Amazon here. I have also had the privilege of getting to know Tara Furman, founder of Knowing God Ministries. I purchased her “Intimacy with God” which truly changed my prayer time years ago. Click the link and go to resources to learn more. 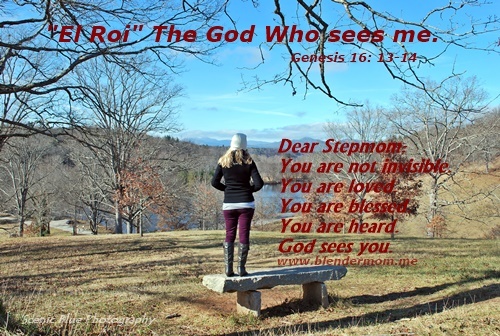 I have written numerous posts about stepfamilies, stepmoms, and biomoms. However recently, I have been thinking about the dads and how they feel in this whole blended/stepfamily thing. When I was a new stepmom, I scoured the internet for posts, articles, etc on stepfamilies and being a stepmom. 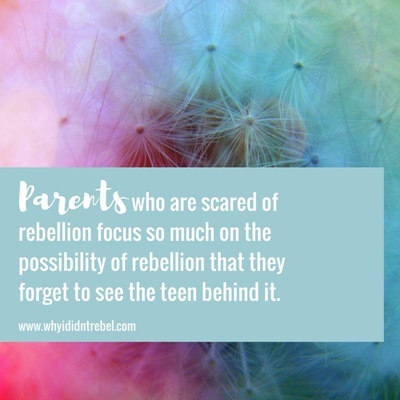 During that time, I saw comments and posts from stepmoms who complained about how their stepchildren created so much conflict in their marriage. Some shared how they felt alone and isolated while their husband seemed oblivious. Some shared that their husband’s children could do no wrong in his eyes. Does any of this sound familiar? I know that as a mom in a blended family, it can be filled with emotion. You can feel alone and invisible which is why I wrote about Hagar, in this post Dear Discouraged Stepmom and her role in the story of Abraham and his dysfunctional blended family. “The matter distressed Abraham greatly because it concerned his son.” Abraham was in agony because he was caught in the middle over his son. His heart was burdened. His wife wanted no part in sharing with a son that he fathered with another woman, whom nowadays would be considered his ex. He wanted his wife happy but he also felt, naturally, a strong loving and loyal bond towards his other son. I know when we are hurt and frustrated it is hard to see past our own emotions, but are we truly treating our husbands with kindness? OR do you harbor resentment and allow it to bubble up and spill over in the relationship you have with his children? 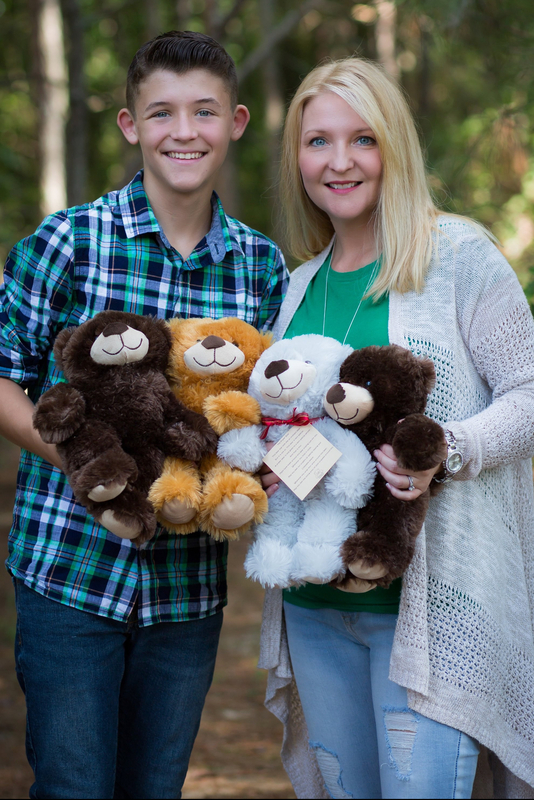 I recently did an interview The Stepmom Series with Our Blended Home about being a stepmom. 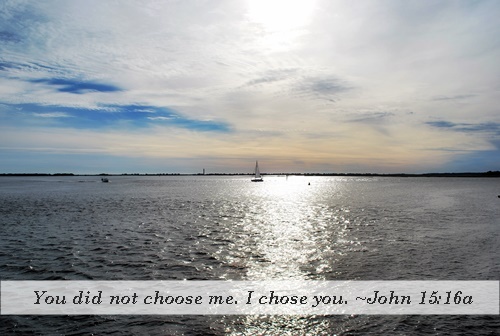 I shared that I made the commitment to love my stepson when I made the commitment to love and marry my husband. God has richly blessed us and just as I feel for my own children, I miss him when he is at his other home. Just as my own, I talk about him with my husband and we laugh about the cute funny things he says and does. I worry about him. I pray for him. We work so hard as moms and stepmoms to love and care for every one around us but sometimes we fall short in extending grace to the closest person here on earth that we have: our husbands. I know that I have the power to hurt my husband very deeply through not only, of course, how I treat him but how I treat his son. Proverbs 31:12, “She brings him good, not harm, all the days of her life.” That means loving him and loving his family! 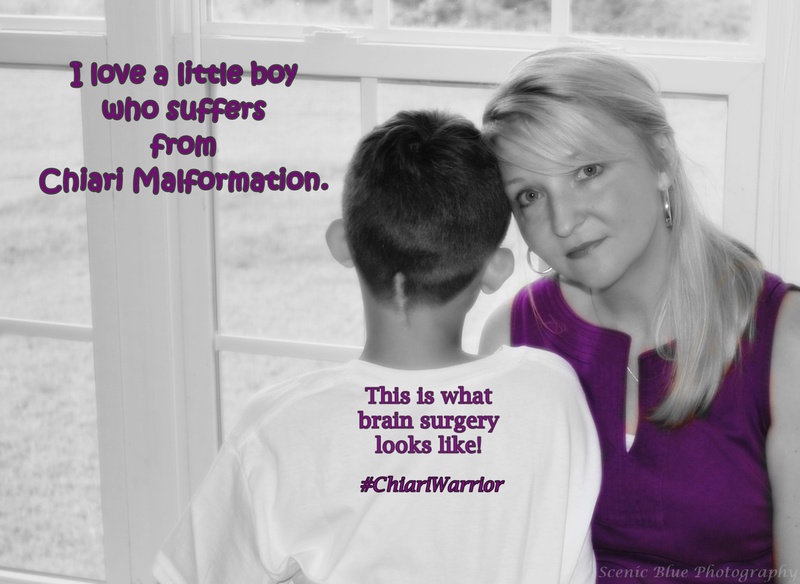 September is Chiari Malformation awareness month. Last September I would have not been able to tell you what that meant or why it was important. I saw no Facebook friends lit up with purple, no posts, no ribbons. This year, the word awareness takes on a whole new meaning for myself and my family. My 7 year old daughter Willow has been suffering from horrible headaches for years, headaches we were told were migraines. She has suffered from horrible insomnia, trouble swallowing, and random dizzy spells. When the constant calls from school got to be overwhelming, we finally demanded more answers about her headaches. I have learned that God made Willow a fighter, a fighter who had absolute trust that God would make her better. What I have learned is that all my planning means nothing compared to His plans. His points of connection are miraculous. The way He put me in touch with the people I needed, the way my daughter was a zombie in the hospital until her big brother showed up and she lit up with the biggest smile, the only smile, I’d seen in days. The way that He orchestrated us to live here, with the best medical attention we could get. I was slow in getting there, but this journey has shown me that I have to rely fully on God, because it really is all in His hands. In Jeremiah 29:11 it says, “For I know the plans I have for you,” declares the LORD, “plans to prosper you and not to harm you, plans to give you hope and a future.” When facing a silent disorder with no cure, plans for a hope and a future are the most comforting thing to have. I cannot wait to live out the way He has worked in our family, because I see the seeds of it sprouting even now. Today she is 9 weeks post-surgery, with only one headache to speak of since then, no numbness in her limbs, and a happiness I wish I could put adequately to words. How blessed we are to see her discover life without the pain she had been dealing with for so long. What does purple mean for me? 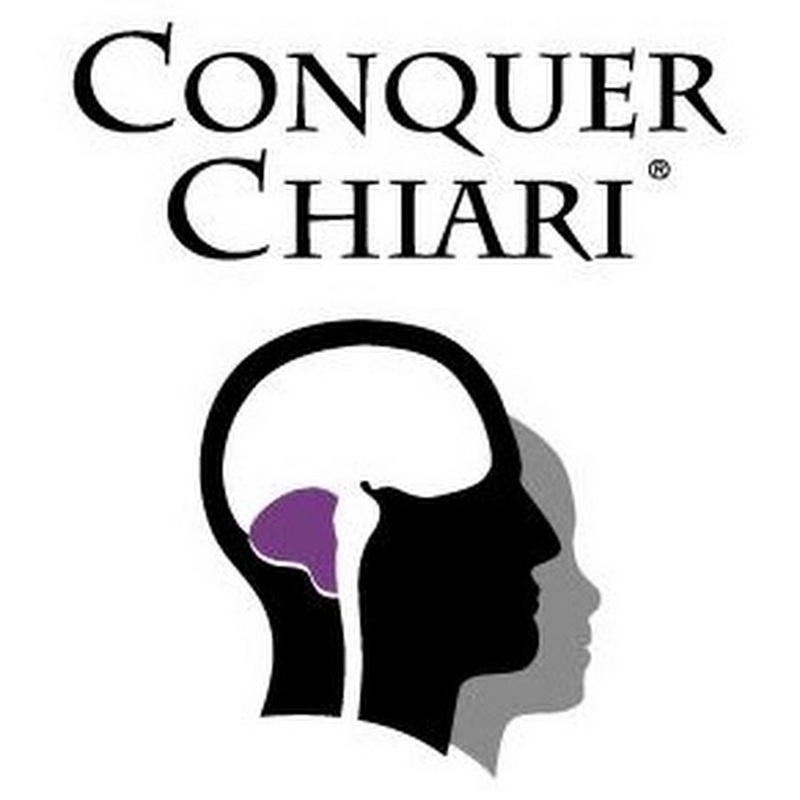 Sure it means Chiari and this thing we will always be aware of. But it also means hope and a future, and connections that only God can make. It means power and renewed faith. Purple is the color of royalty, so I suppose it’s a good thing I have a direct line to the King. During the service last Sunday, I was reminded of the story of Joseph and how his brothers sold him into slavery because they were jealous. But it wasn’t what they did that gripped my heart. It was his reaction when he was reunited with them years later! Have you been going through a really hard time because of someone’s actions? 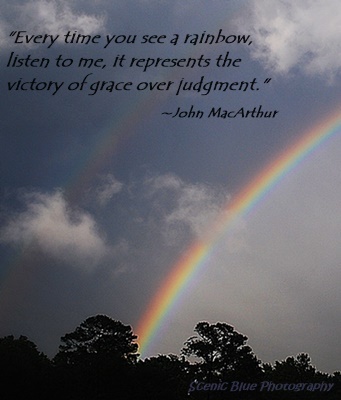 Having trouble trying to see the good in something painful? I have had trouble, especially in the past, of forgiving and letting go. I’ve wanted them to know what it’s like to hurt as they had hurt me or mistreated my family. If I am holding onto the pain and anger placed there by others then my hands are too full to take hold of the beautiful blessings that God is trying to give me. 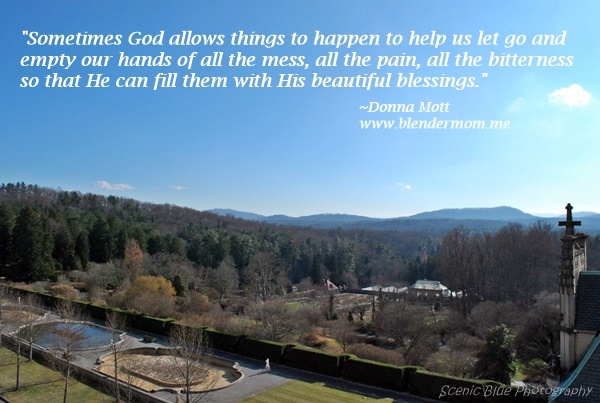 Sometimes, He allows things to happen to empty our hands of all that mess, all that pain, all that bitterness so that he can fill them to overflowing with His goodness! I encourage you to let go of the mess placed there by the ex. Let go of the mess placed there by a family member. Let go of the mess placed there by a friend. Drop it and embrace all the good things God has planned for you. I have seen it all over Facebook and social media along with everyone else; opinions exuberant or angry over the supreme court ruling on marriage yesterday. People practically shouting about God’s judgement while others joyously displaying rainbows shouting back equality with hashtags such as “#lovewins”. And I believe deeply with every thing in me that love did win, but not in the way you might think. See, for me love won on the cross when Jesus laid down His life for the ones shouting hell and judgement. For the ones shouting equality. For my enemies. For the ones I love most dearly. For all. For me. John 3:16 “For God so LOVED the world that he gave his one and only Son, that WHOEVER believes in him shall not perish but have eternal life.“ One of the most quoted verses in the Bible does not say “whoever believes unless” it says who. ever. believes. The gospel of Jesus has not changed. It is the same today as it was yesterday. It is that love, that sacrifice that we need to be sharing with the world as Christians. Leading everyone to the cross. Leading everyone to Jesus. I am a follower of Christ because I believe He died and arose again. I believe He is the picture of unconditional perfect love; a picture of God’s love in the flesh. As I wrote about in my last post, I did take that step of faith toward a speaking ministry. In my message I shared that sometimes you just have to let go and let God be God. Shouldn’t we be leading others to the Cross and not trying to pick and choose what sin we think someone else needs freedom from? Lead them to Jesus and let Him cleanse their hearts from whatever He deems unclean. It is with deep conviction that I say rather than voicing opinions that we simply lead “all who are thirsty” to the only One who can quench that thirst through grace, love, and mercy. Photo taken at Chatlos Memorial Chapel. We have all gone through seasons of change; seasons of fear; seasons of testing; seasons of forgiveness; seasons of miracles. My emotions have been all over the place since going through so much with my son as well as other things that have popped up in my life. I have had to take a step back from writing and other things, pray, and regroup. I have been feeling God pulling me to venture out of my comfort zone and serve Him in different ways than I have in the past, particularly speaking publicly about some amazing truths and scriptures He has revealed to me. Then I remembered the sermon and the scriptures about God giving you rule over little before He allows you to rule over big. 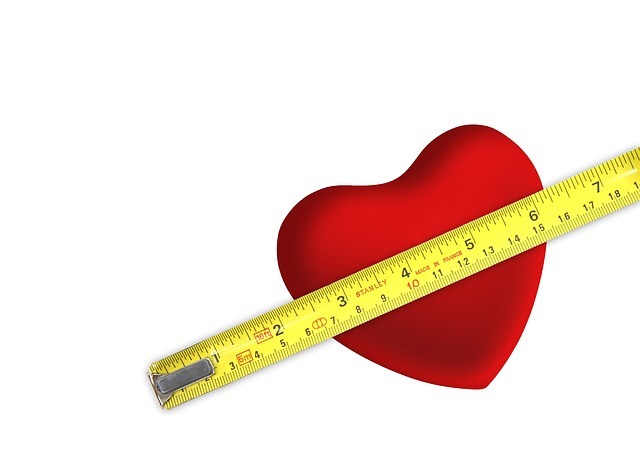 My heart was convicted. I called my dad back and told him how honored I would be to share and speak at the Wednesday night service. So tomorrow night, I am taking that step of faith into what may seem like to some as the little room. I am going to trust Him and if only one person shows up, I will pour out my heart to that one person in obedience to the Father. 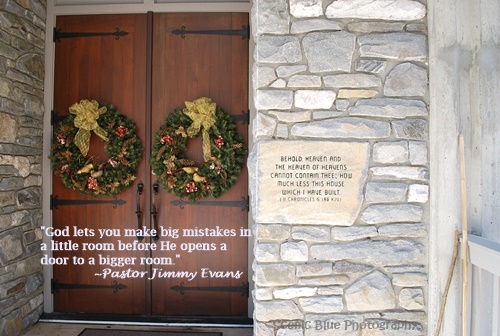 Praying with each small act of my obedience to go in the direction He is guiding my heart, he will open another door. The more I am faithful; the more I lean into God, the more He will trust me and give me more opportunities to serve Him. So my question is what are you doing with your little as you are waiting for your big?